LED Lighting has never looked so good. 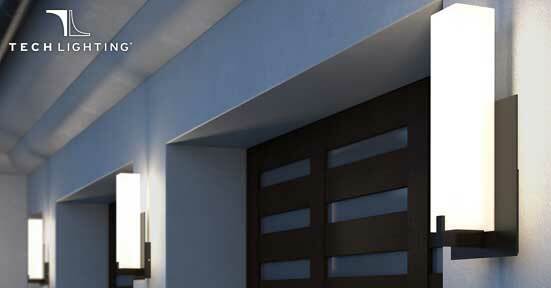 Saving energy with new fixtures is both energy-efficient and stylish. 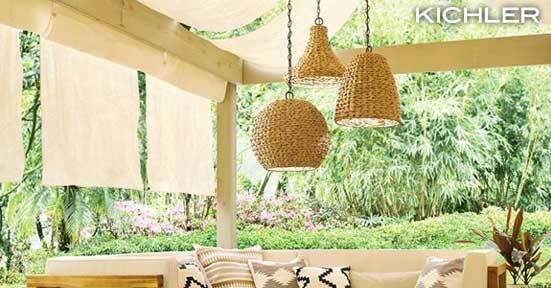 Palisades Collection – The Palisades outdoor pendant collection from Kichler features a Natural Wicker globe shade with Olde Bronze Finish. The perfect addition to your patio, porch or gazebo, this pendant achieves energy efficiency with an outdoor-rated LED bulb. Calligraphy Collection – A dramatic addition to any space, Corbett’s Calligraphy pendant design evokes swirling script flowing across the page. 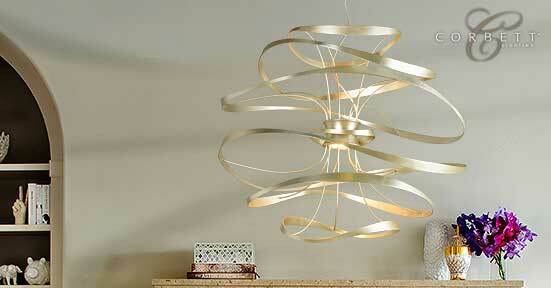 At its core are two powerful LED light engines, surrounded by floating bands and held in place by thin, curving lines. Airy and sculptural, this unique fixture is made from hand-crafted iron and hand-finished in modern Silver Leaf. Available in four pendant sizes and a wall sconce, this energy-efficient light will bring both beauty and movement to your home. Arramore Collection – The Arramore Collection from Feiss is a perfect example, melding style with substance. 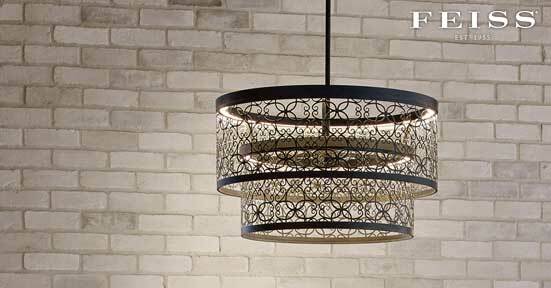 The collection features LED Halo Rings integrated in a delicate pattern finished in Dark Weathered Zinc. The modern silhouettes of these pendants and wall lights are equally suited for indoor or outdoor spaces – and are also Dark Sky compliant. Cosmo Collection – If you favor contemporary designs and cutting-edge technology, you will be drawn to the Cosmo Collection by Tech Lighting. The elegant, contemporary LED wall sconces feature a rectilinear acrylic shade mounted on a die-cast aluminum base with marine-grade powder coat finish. Shade colors include Frost White, Amber Frit, White Acrylic, or White Frit, and base finish choices are Antique Bronze, Chrome, or Satin Nickel. Suitable for either indoors or outdoors – wet-listed for resistance to dust and water. 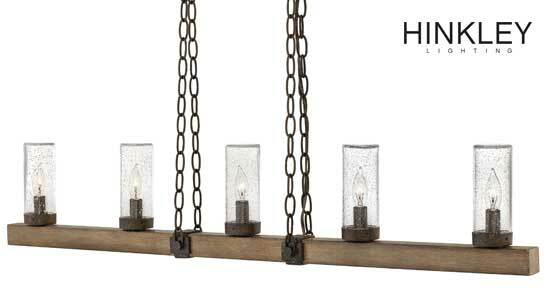 Sawyer Collection – Traditionalists will love the industrial look of Hinkley’s Sequoia Linear Outdoor Chandelier. The faux wood finish coated steel ensures maximum resilience to outdoor conditions, while the Clear Seedy Glass shades are ideally suited for vintage filament bulbs or dimmable LED candlelight bulbs. Bring a look of rustic elegance to your outdoor space and enjoy years of beauty and performance.